The stifle joint is a complex joint of the hind limbs in canines and other quadruped mammals. It consists of “femorotibial articulation”, “Femoropatellar articulation” and attachments. The joint is enclosed in cartilage like a capsule, which has several layers of hard and soft tissues containing “synovial fluids” in it, which acts as a shock absorber. The joint is stabilized and bone endings are attached with the help of ligaments. These ligaments lie crisscross and are called a “Cranial or anterior cruciated ligament” and “Caudal or posterior cruciated ligaments”. Reprinted with permission by the copyright owner, Hill's Pet Nutrition, from the Atlas of Veterinary Clinical Anatomy. These illustrations should not be downloaded, printed or copied except for personal, non-commercial use. “Sesamoid bones” help in the smooth and maximum articulation of the joint. The number of these bones may vary from 2 – 4 depending on the breed. 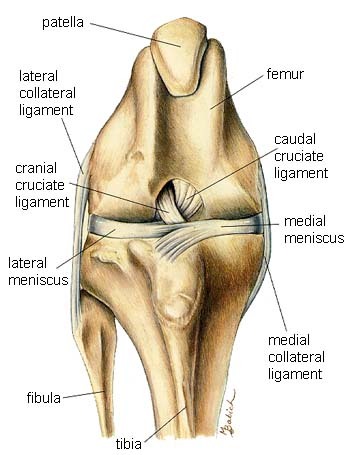 The patella is an example of such sesamoid bone, which is also called the “Knee cap”. Different conditions, diseases, fractures, accidents and degenerative factors can indicate if canine knee surgery is needed. Patellar Luxation; Patellar luxation is a congenital problem in dogs, where the patella may develop ectopic (in the wrong position) or become displaced centrally or on the side of the femoral groove. It may occur due to problems in the hip joint, femur, tibia or hypoplasia (degeneration of cells) of the femoral condyle. Patellar luxation may be classified as Grade I or II. Grade I is a mild and and initial form of patellar luxation, while grade II is a severe form. Dogs may show signs of lameness and a skipping gait. Canine knee surgery for patellar luxation involves orthopedic surgery (joints, bones, ligaments) and soft tissue surgery. Techniques used include “Fascial releasing Incisions” & “Joint Capsule Imbrication”. Surgery may involve transpositions (moving tissue), tuberosity derotation (creating a point on the bone for the attachment of a muscle or tendon), osteotomies (cutting of bone) and even limb amputation, depending upon the cause of the problem and the severity. Post surgical care, antibiotic therapy and mild exercises are essential. Prognosis ranges from mild to good. Cruciated Ligament Rupture; Ligaments which attach the tips of the tibia and the femur are called cruciated ligaments. Up to 20% of dogs will suffer from this type of injury. These ligaments lie crisscross and may get ruptured or torn due to a trauma, injury, degeneration, immune deficiency, or if twisted. Affected dogs may show signs of lameness, “Drawer sign” – joint shows cranial laxity (appears loose) on examination and tibial rotation. It is more common in dogs that are overweight, large breed dogs (Labrador Retrievers, Rottweilers) and older dogs. Dogs may appear to be "lame" for 2 weeks adn then suddenly get better if the ligament is not torn. However, pain often returns 4 to 6 weeks later, often leading to arthritis in the knee. Canine knee surgery may involve restoration by grafting artificial or synthetic ligament material or stabilization by levelling the tibial plateau. One common approach to the surgery goes by the name TPLO (Tibial Plateau Leveling Osteotomy). In the case of injuries,traumas and degeneration, removal of non vascular tissues is required. Medication involves post surgical antibiotic pain killers and supportive therapy along with walking exercises and swimming. Prognosis is good after surgery and recurrence depends upon the surgical procedure selected. Stifle or Knee Joint Fractures; Stifle and other joint fractures are common in immature and young animals. Traumatic fractures may involve any part of the stifle joint, patella, tibia, femur or cruciated ligaments. Clinical signs of stifle joint fracture are lameness, swelling and pain. The location of the fracture is usually determined by the fracture classification created by “Salter – Harris”. Dog knee surgery is usually preferred for a complete and precise anatomical reconstruction of the joint. It may involve internal fixation with sutures, pins, wires and screws for stability in fixation. Prognosis of knee or stifle fractures usually depends upon the procedures of surgery and the severity of fracture. Arthritis; Arthritis is an inflammation of the joints. Degenerative and septic (bacterial) arthritis may require a surgical approach along with medications. The use of drugs and supportive therapy is preferable , but several types of arthritis which involves degeneration of joint tissues, or many bacterial infections causing puss in joints may also require surgical removal of debris, puss or any material which can cause irreversible damage to the joint. Homeopathic remedies such as PetAlive Muscle & Joint Support Formula contains ingredients such as Glucosamine and others (Harpagophytum procumbens, Arthrospira platenis, Calcium fluoride,Natrium sulphate ) which can help to treat the symptoms, relieve pain and reduce the sttiffness of arthritis, rheumatism and degenerative joint disease in dogs. The manufacturer is a good source of information and clinical studies on canine arthritis. Surgical removal is only preferred in severe cases of arthritis which is diagnosed as a degenerative type.